Someone who works for Arkedo Studio, the folks responsible for Big Bang Mini on the DS and the Arkedo Series on XBLA, let it slip a few days ago (on NeoGAF) that the Parisian developer recently killed a rather promising-looking--in my opinion, at least--Natal project. The name of said project: 2-Finger Heroes. 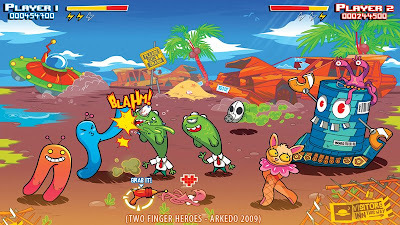 According to the Arkedo staffer (supposedly Arkedo Studio CEO Camille Guermonprez), the game was set to be a side-scrolling "beat 'em up" with a twist: Players would use their fingers to control their on-screen counterparts' legs. As for the game's story: Guermonprez said it would be "a silly tale of friendly invaders who did not have enough time to scan the entire human body! So they are left on Earth as merely fingers (yup, scan was 3 percent complete), but with the WILL TO LIVE AND FIGHT THEIR NEMESIS, THE GIANT FOOT FROM OUTERSPACE!" Why was it killed? "One of the designs flaws of this, apart from the fact that it demanded some very precise pattern recognition from the Natal system, is that it would have been HELL to localize," Guermonprez explained. "Yup, what can be understood as the victory sign in France, could be a terrible insult in the UK, for instance. And we are not even talking about Italian. Oh, the possibilities..."
For more mockups of 2-Finger Heroes, check out this NeoGAF post--and then shed a tear (or two) for what could've been a very cool game. Dang. That looks like it would have been such a cool idea.